Provide easy access to buses and other road transportation with bus stop kerbs from Marshalls. Urban roadsides scattered with stopping points benefit from a modern design approach to passenger safety, and our variable height bus stop kerb system provides the ideal solution. 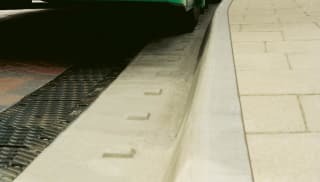 Our bus stop kerbs are smooth and angled, designed with users in mind. They can be installed with an optional rumble strip, enabling the driver to assess the position of the vehicle and park as close to the kerb as possible. Each kerb has been designed to withstand the impact and wear of bus wheels. Varied upstands between 100-250mm can be achieved to suit different entry levels of public transport vehicles. Explore the different heights, face lengths and widths of our bus stop kerbs to find the right one for your requirements.